If one were to carefully study the several ways in which Christ Himself turned much of the Old Testament on its head, one might end up being very surprised. The woman taken in adultery was forgiven, not stoned. The Sabbath was not kept in order to demonstrate that the “Sabbath was made for man, not man for the Sabbath." He exalted and healed those who were not Jews, but "sinners" from among the nations. The Old Testament forbids the deformed, maimed and unclean to enter the temple; Christ fellowshipped with them and healed them. The Prophets rebuked the wealthy and Israel in general for ignoring the plight of the poor, the widow and the orphan; Christ made caring for them a prerequisite for entering the heavenly kingdom. Even the kosher food laws were overturned when the scroll was unrolled before Peter on the rooftop. Perhaps, then, Christians should be wary of trying to reinstitute even elements of the Old Testament Law. Christ said that no point of the Law would pass away until all things were fulfilled (Matt. 5:17-18), although He had already overturned major elements of it. 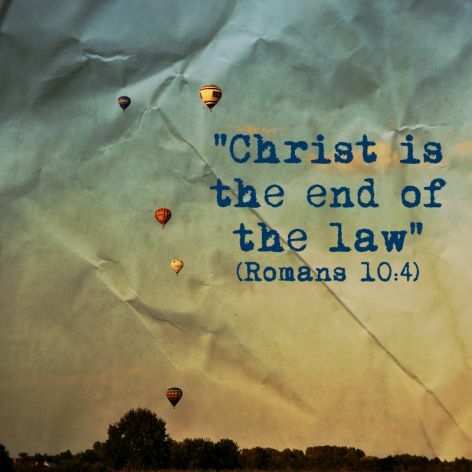 But when He proclaimed "It is Finished," all things were fulfilled and, as our beloved father Paul tells us, the Law was abolished (Eph. 2:14-15). Moreover, "if there be established a new priesthood, there is of necessity a New Covenant" (Heb. 7:12). And if a new covenant, then what "Law"? For, “in that he says, `A new covenant,’ he has made the first old. Now that which decays and grows old is ready to vanish away” (Heb. 8:13). If the Law is replaced by Grace (the law could neither sanctify nor perfect, nor could it transform the inner person, nor could it save anyone), and by a new law of Love, then why should any dog return to its own vomit when a banquet of love and grace has been set before it? If we seek to reinstitute the law of the Old Covenant, then by that do we not renounce the New Covenant, and with it the High Priest by Whom it is established in His own precious blood? Should those who wish now to reinstitute even one jot or tittle of the Old Law, thus re-establishing the Covenant that has passed away, not rather tremble and repent for having renounced the blood of Christ which established a New Covenant and a priesthood after the order of Melchizedek, abolishing the priesthood after the order of Aaron? Can one embrace one jot or tittle of that Law without renouncing the Grace which replaced it? While not fully accepting this, still a very good piece.